Right now we have the rare opportunity to restore a major food source for an endangered and starving orca population off the U.S. West Coast. The Columbia and Snake rivers once produced an astonishing number of wild Chinook salmon, one of the most commercially and recreationally sought-after fish species due to its high nutritional content and delicious flavor. Yet now, outdated dams prevent salmon recovery, and in turn leave a distinct population of orcas hungry and on the verge of extinction. The four Lower Snake River dams (Ice Harbor, Lower Monumental, Little Goose and Lower Granite) must be taken down to make recovery a viable option for both endangered salmon and Southern Resident orcas – this is the most economically and ecologically beneficial option. Tell the U.S. Army Corps of Engineers, the Bureau of Reclamation, and the Bonneville Power Administration to remove these four dams on the Lower Snake River and save Chinook salmon and Southern Resident orcas. Southern Resident orca and Snake River salmon can wait no longer; the four Lower Snake River Dams need to come down. These dams have severely diminished important Columbia River Basin salmon stocks, and in turn these diminished stocks have a direct adverse effect on the iconic endangered Southern Resident orca population. With the recent court order to conduct a full environmental impact statement, we request the consideration and adoption of an alternative to breach, bypass, or remove Lower Snake River Dams. Now is the time to fully consider the ecological, social and economic benefits of a free flowing Snake River. We urge this action not only to recover threatened and endangered salmon populations, but also to protect endangered orca that rely on abundant Chinook salmon populations. Dams on the Columbia and Snake rivers have greatly reduced and eliminated historically accessible habitat. Over half of Columbia Basin salmon populations have been lost forever and multiple others are endangered and threatened with extinction. Dams and the associated impacts to water quality, temperature, and flow have led to steep reductions in the salmon that are the Southern Resident orca’s prey. Evidence shows that these orca whales are experiencing nutritional stress throughout the year, and thus, a greater supply of Chinook salmon would buoy the population in the face of other threats, such as toxic contamination and vessel interference. The single most effective action to take toward recovery of Snake River salmon and Southern Resident orca is to remove these dams. Status quo is insufficient; agencies have proven that billions of dollars put toward mitigating the damage done by these dams will not recover salmon populations. 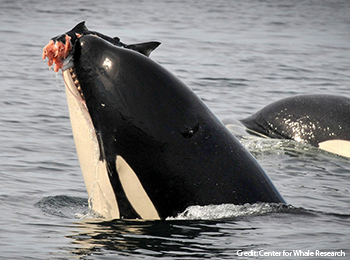 Bold action is required to save these endangered orcas and the Chinook salmon upon which they depend. These populations need a plan that will actually achieve recovery. Please fully evaluate the benefits of dam removal including the benefits to this dwindling population of beloved killer whales. Thank you.